Oceanside, one bedroom efficiency w/beach access and pool! This oceanfront complex is located in Atlantic Beach! Fun for the whole family with pools and private beach access! All rates are subject to a departure cleaning, linen and reservation fee, 12.75% sales tax and a $50.00 Vacation Rental Damage Protection Plan. All fees and taxes are subject to change without notice. 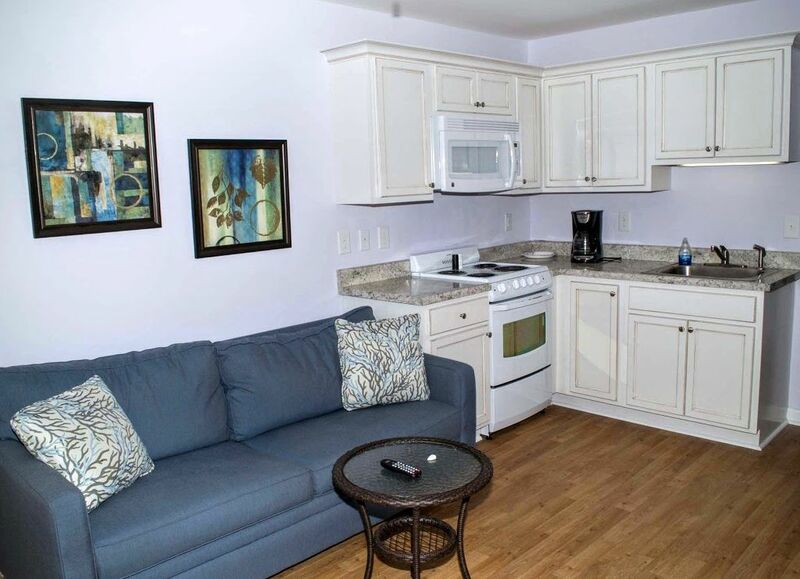 Great efficiency room in a wonderful location right on the beach. I'd booked this through a website (travelocity?) and was on the phone while booking. I saw charges that were not what I expected total wise. The charge was higher. I reviewed my booking process and found that I missed a couple of fees that were OBVIOUS HAD I NOT BEEN DISTRACTED. Wife wanted the trip so I was going to make the best of it. I called up Cannon & Gruber to finalize (first to try and wiggle into less charges - i was past the point of no return ie..24HR window). I worked with Melissa. She was sympathetic and absolutely did what she could. Shortly after she called and told me that there was an issue with the cable and offered another room. She went the extra mile and was very professional; as was anyone else I spoke to. The room was very nice and up to date. The proximity was good as well. A short walk to the beach, plenty of dining, sights and shopping close by. I paid a little more than expected but - the quality of the room and the personal service provided by Cannon & Gruber made it a value in my opinion. I am a deal seeking frugal to a flaw shopper. I will however, pay more for the right level of service and quality. This is the right level of service and quality I don't mind paying for. Perfect location, close to everything you would need. enjoyed my stay very much.